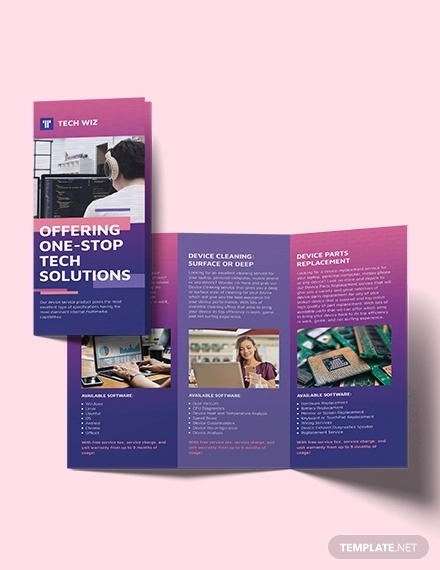 Brochures have always been a go-to solution for businesses and companies that want to do more in their advertising campaigns. 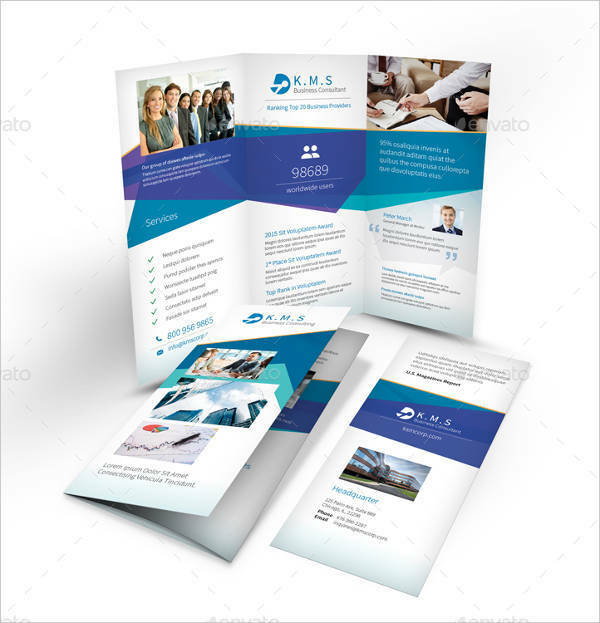 A brochure is one of the most important and effective communication tools of letting the public know who you are as a company and what it is exactly that you do. They are concise, practical, and resourceful. 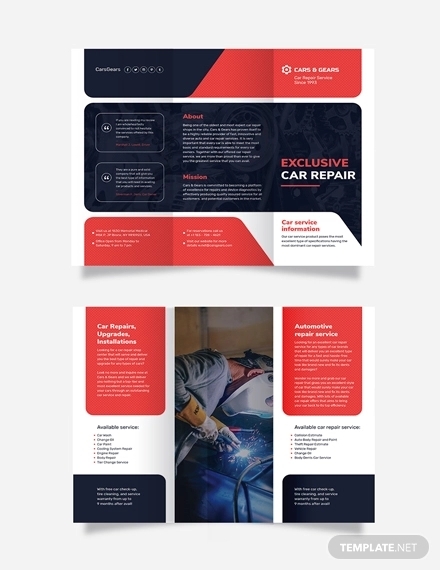 A service brochure is definitely something you want to tap into. 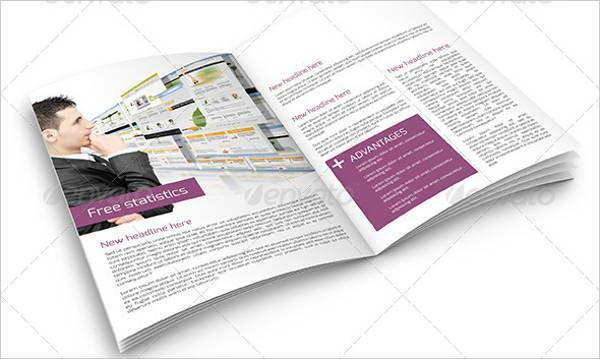 It’s a type of brochure that presents in detail all the services you have to offer, and the methods of how your potential clients can avail them. 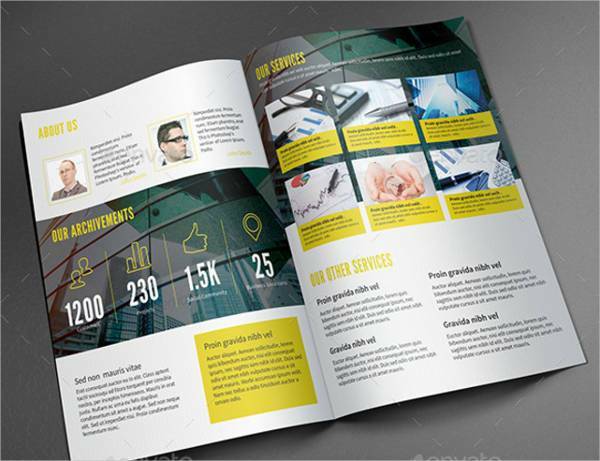 An effective service brochure is informative and presentable with an engaging design. Come up with yours and work with ease by downloading some of our brochure designs to get you started. 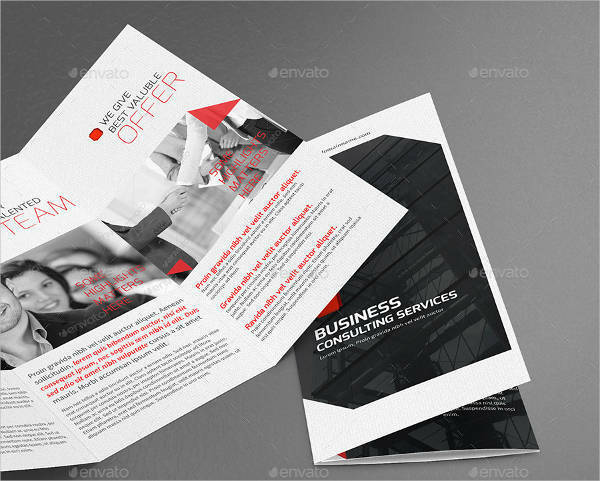 How Can Service Brochures Help Your Business? 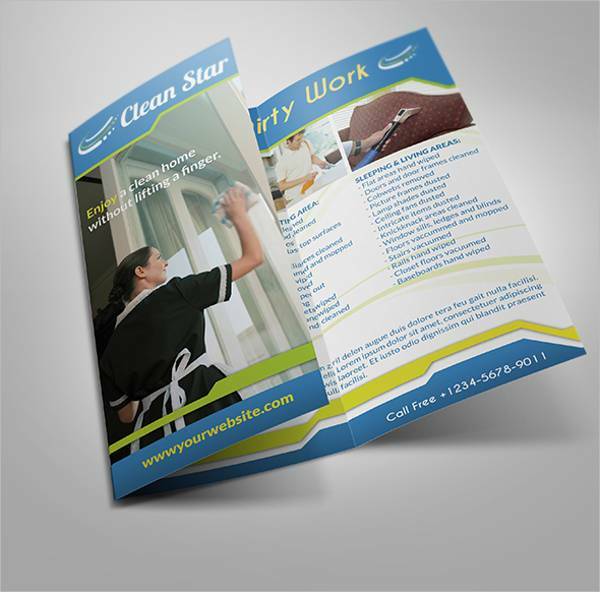 Service brochures play a significant role in helping your business succeed. They are effective methods of gaining new clients and potential business partners and investors. In getting the most out of your service brochures, it’s important to know all the ways they can be advantageous on your part. Service brochures are informative. You can trust brochures to be accurate with up to date information since they are one of the main methods of advertising for companies. Put your best foot forward by presenting everything that makes your company and your services great. 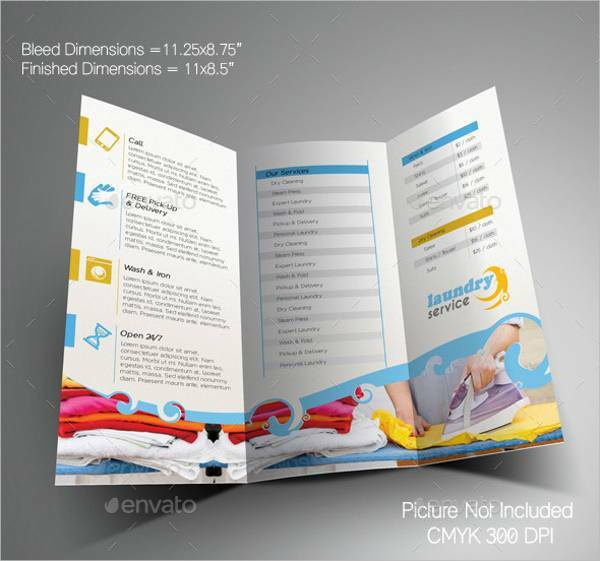 You can make brochures in different sizes and formats to best represent your brand. The ways in which you format your brochure can affect the amount of information you can include. 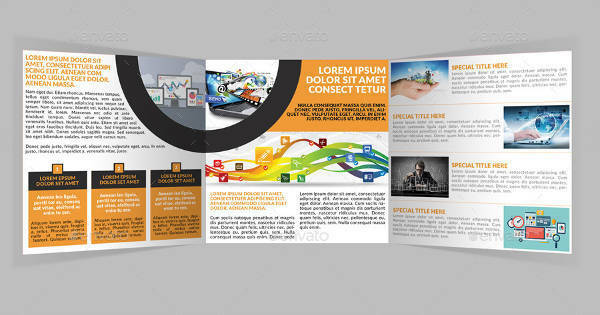 Look at different brochure designs and templates to get an idea of what you might want to prioritize in your brochure. Service brochures are accessible. 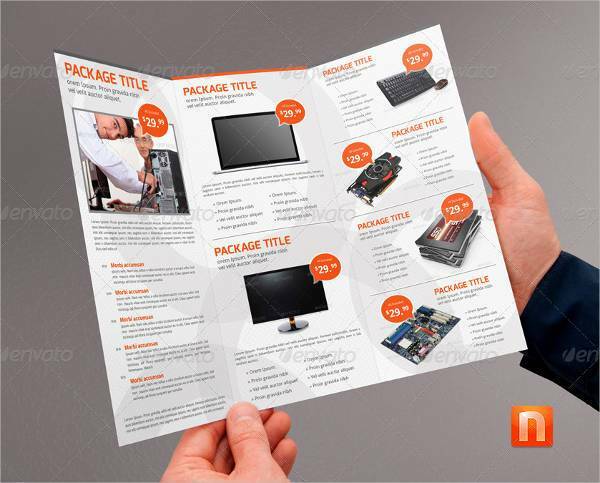 You can strategically display your brochures in areas your target market is usually at. You can hand them personally to passersby or put them on display in lobbies and waiting areas in hotels, clinics, restaurants, or malls. You can mass produce brochures. Since one brochure is equivalent to one piece of paper, you can easily print multiple copies and distribute them to different locations. 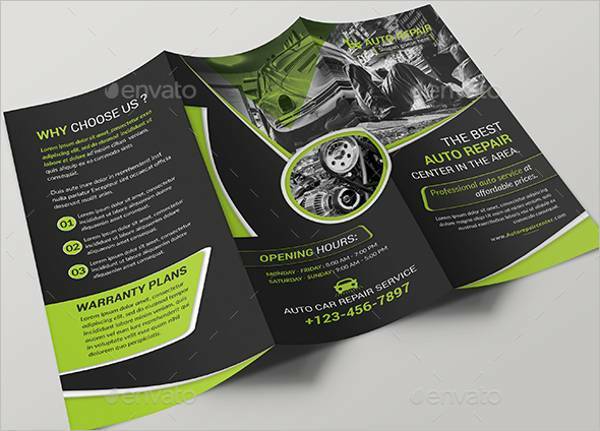 Service brochures can be a form of branding. 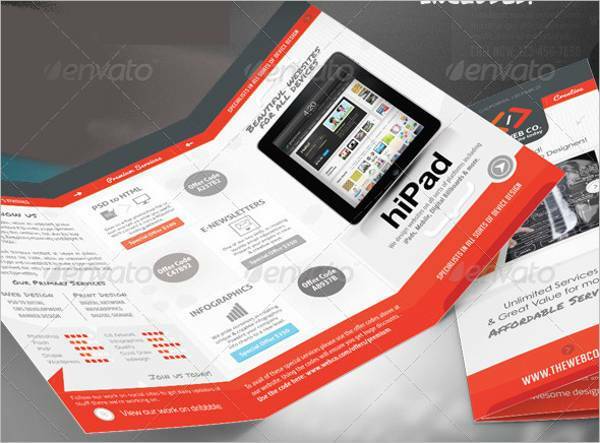 Much like a company logo, you brochures represent your company and all its attributes. 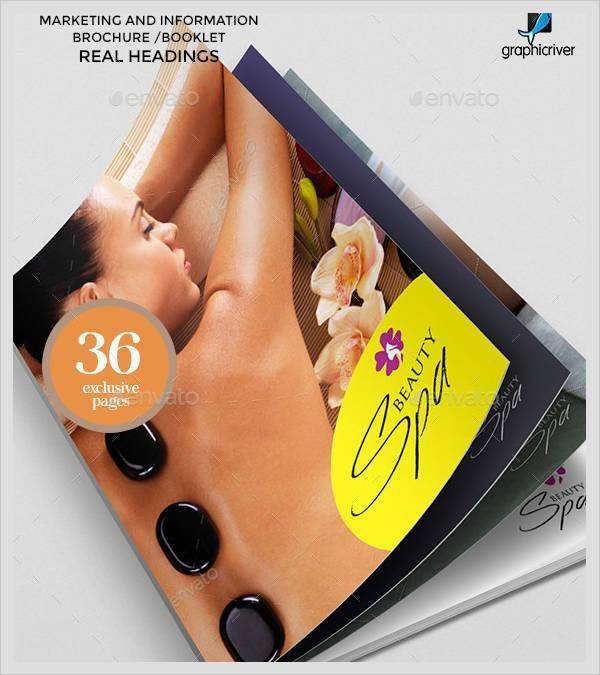 If your brochures look professional, your clients will also treat you professionally. It’s really important that you plan out the content and design of your service brochures. Brochures may be inherently beneficial, but the most successful brochures are those thoroughly designed with substantial content. What are the Different Types of Brochures? 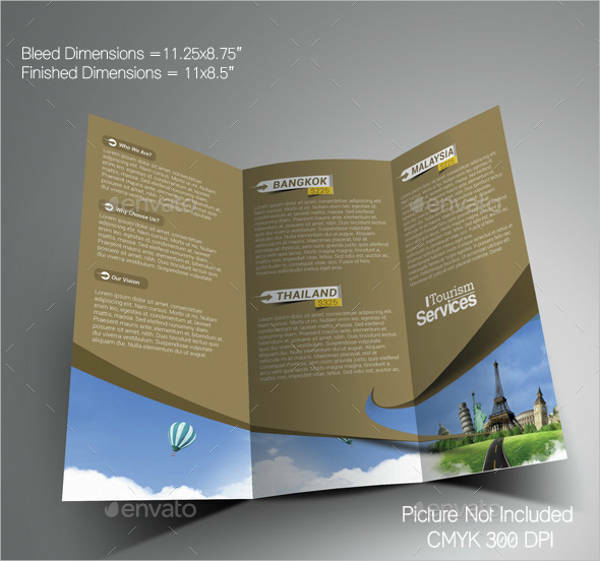 There are several formats you can use for your service brochures. You may opt to use different formats for different brochures, but it would be commendable to stick to a uniformed format to remain consistent with your branding. Bi-fold brochures create two panels on your paper, with four panels for you to work with all in all. With a bi-fold format, you get to work on your brevity with content. 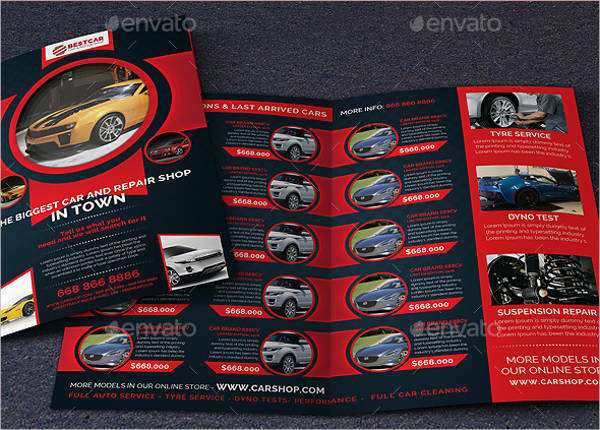 Balance out the images and text present in your brochures in order to have both appeal and substance. 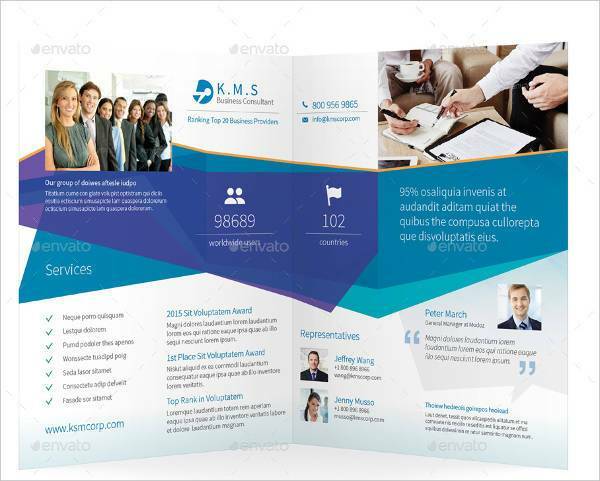 Tri-fold brochures are created with three panels, and a total of six panels for your content. This gives you a chance to elaborate on certain topics or services. You can also cover more topics and set aside panels for images alone. 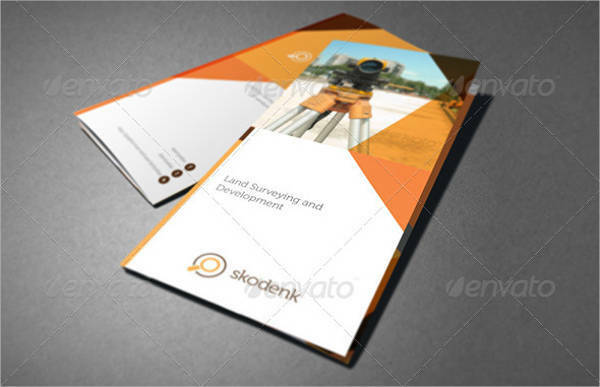 A square-shaped brochure is an uncommon format used by few to add a little personality and authenticity to their brand. It presents an opportunity for you to creatively use space and has its own visual appeal. 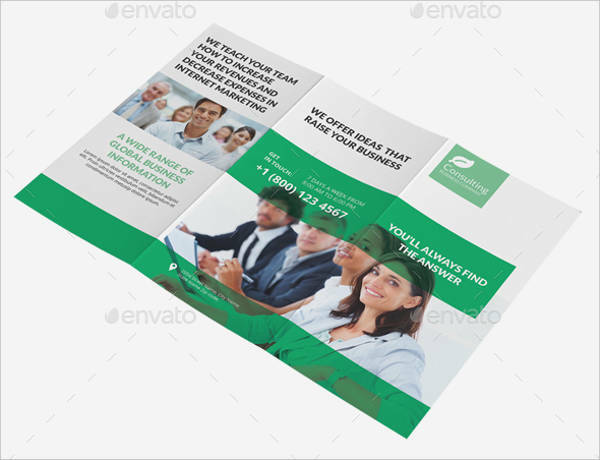 Experiment with a square brochure mock-up to see if it suits your taste. 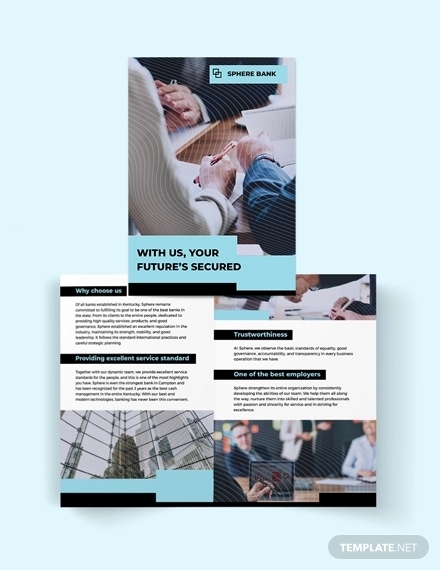 An A4 landscape brochure mock-up is also available for you to present your services in a new and refreshing brochure format. 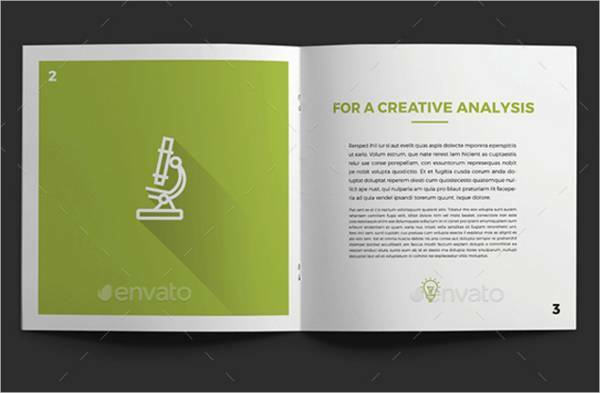 The look is somehow similar to that of a catalog, but you can present more information together with stimulating visuals. 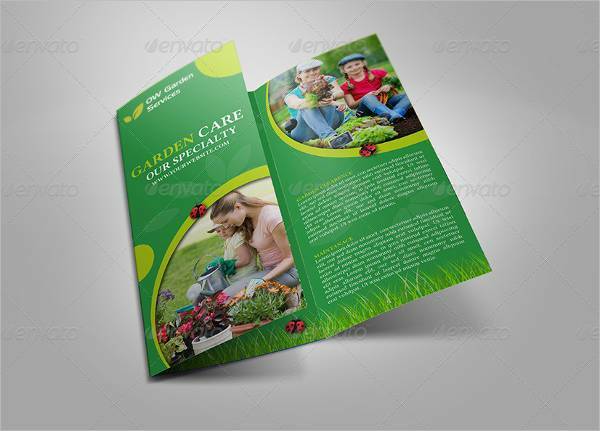 There’s plenty of service brochure designs you can incorporate for your brochures. After all, there are only about thousands of companies and businesses that offer different kinds of services. 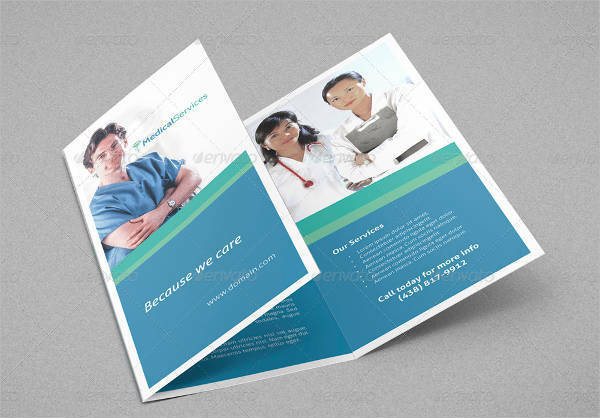 Your brochure design should coincide with the type of service you deliver, and the overall look of your company. 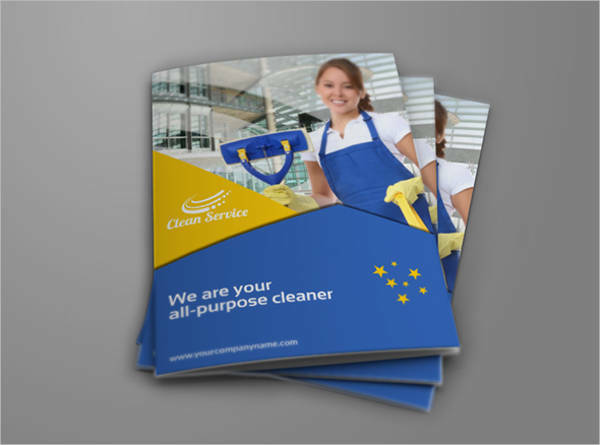 Cleaning Service Brochure – We have cleaning services brochure designs that are formatted in multiple themes to help you decide which one calls out to you most. 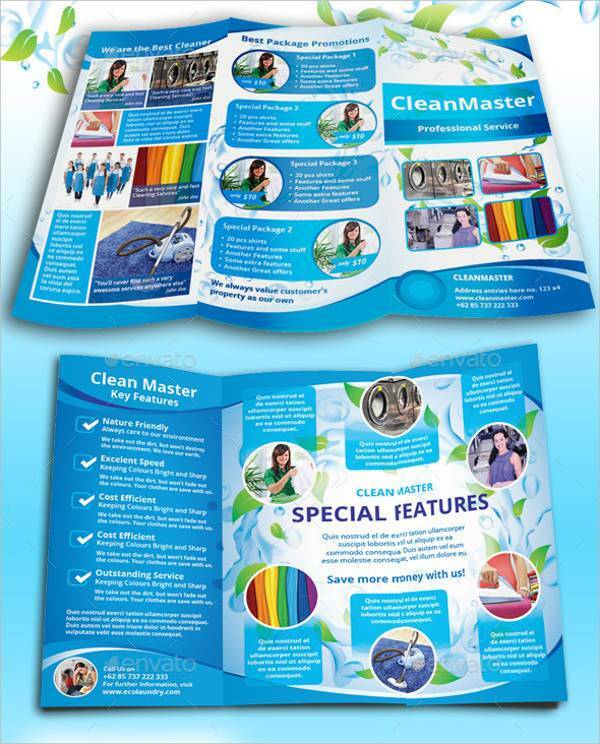 A retro cleaning day service tri-fold brochure is a fresh new take on cleaning services that make them look more fun and intriguing. 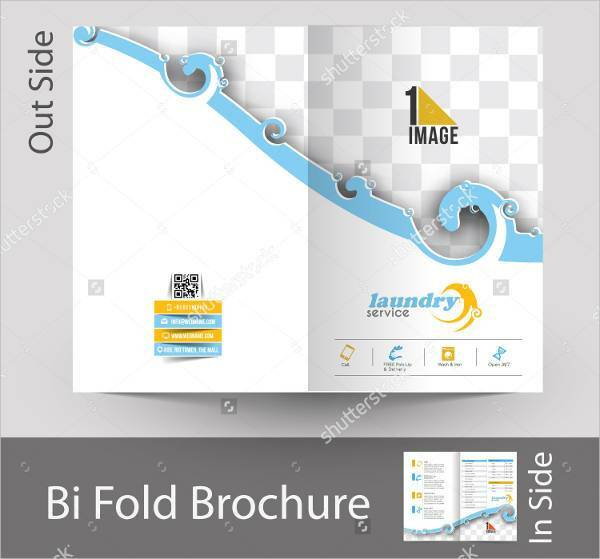 You can also go for the traditional look of aligning images of employees performing some of the cleaning services listed at the bottom half of the brochures. 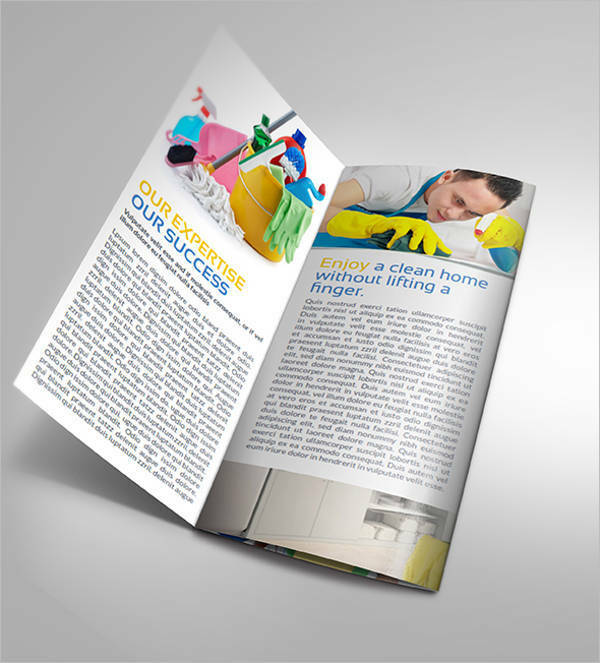 It’s perfectly acceptable for cleaning service brochures to have a neat and traditional look. Cleanliness is, after all, their best asset. 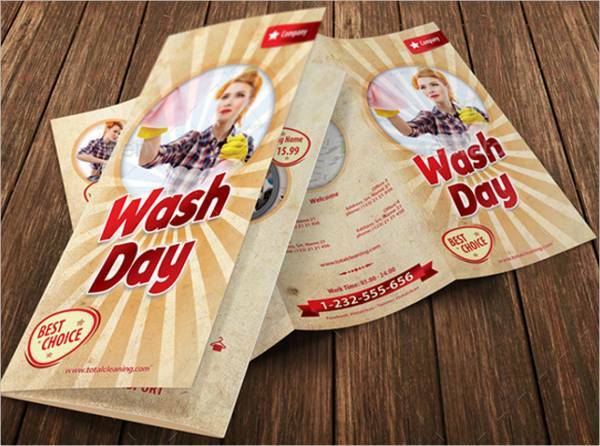 Laundry Service Brochure – There are creative ways to present your laundry services in a brochure. Since it’s a relatively light and low-cost investment, you can be playful with your designs by using icons and soap bubble borders to distinguish your services. Don’t forget to include your logo on the cover of your brochure and the methods available for customers to avail your services. 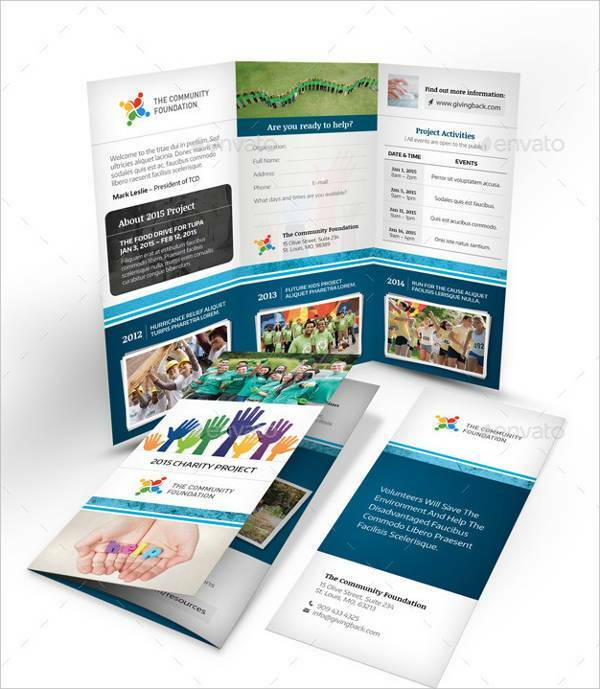 Community Service Brochure – Community and charity brochures are created by organizations to make the public aware of unfortunate conditions and issues that affect certain countries or minority groups in the world. They provide a brief profile of the organization and an overview of the cause of the issue at hand. Panels are then utilized for different programs and services one can take part in. This kind of non-profit brochure also provides inspiring images of volunteers and beneficiaries. A call to action is always present in community brochures to encourage the reader to volunteer and be part of making a change. 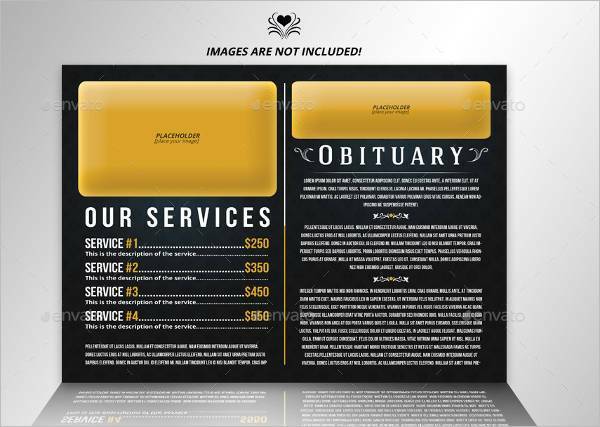 Funeral Service Brochure – When making a brochure for a funeral service, keep in mind its reader is likely to have lost a loved one and is still in mourning. Keep your colors monotonous and subdued. Be straightforward in offering your services without sounding too detached. Carefully structure your sentences to sound approachable but professional. Make sure to indicate the price rates of the services you offer and contact information to be open for inquiries. 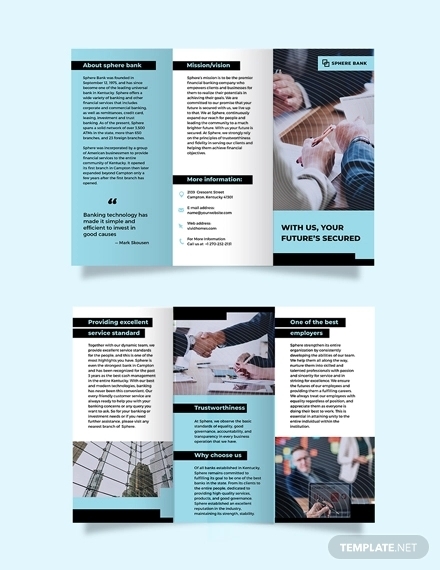 Corporate and Law Firm Brochure – Our corporate and law firm brochure designs show some of the best ways to keep your brochures looking sleek and professional. 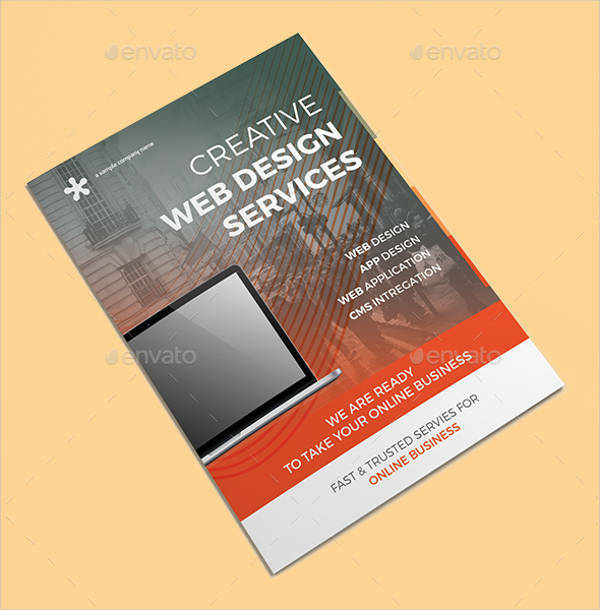 Since these are formal and serious business endeavors, their service brochures are usually quite direct and often intimidating. Make use of dynamic graphics and shapes, but in a minimalist and organized format. They can either strictly incorporate the company’s color scheme, or use a clean palette; one that’s not too loud nor distracting. You have to assume your brochures will fall into the hands of individuals who have no idea who you are yet. With that in mind, you’ll always be motivated to make a good first impression. 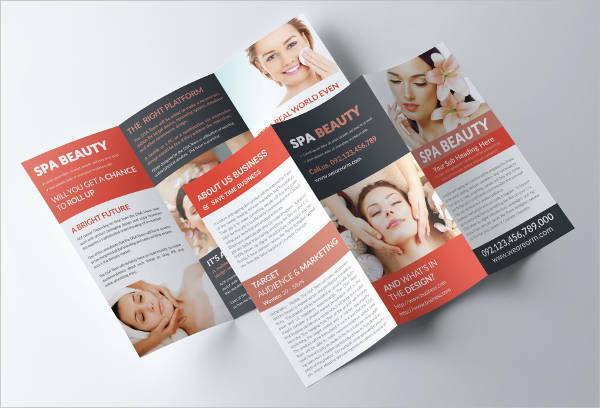 In designing your brochures, your identity as a business or company should be visible and easily comprehended by your readers. Provide a company profile to give your readers a brief overview of who you are as a company, how you started out, and your achievements. This is one way of gaining trust and confidence from your potential clients. Incorporate company colors and logo. Your identity as a company should be seen and felt by the reader through your visuals as well, not just through text. Setting the tone of your brochure with your colors brings the reader closer to the company. Set a consistent mood in your service brochures. 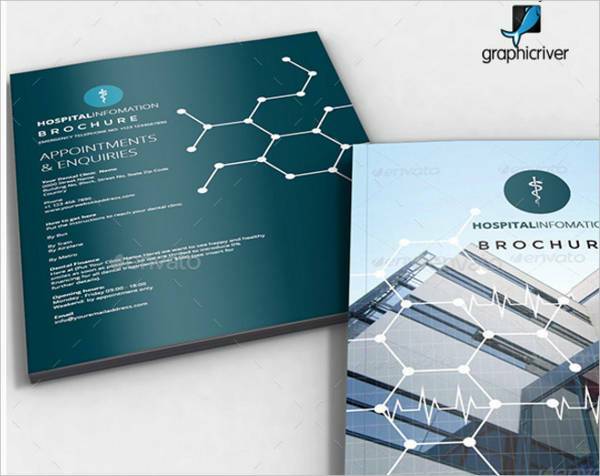 If it’s a professional corporate brochure, be direct with modern graphic design. A funeral service brochure may call for dark and subdued themes. 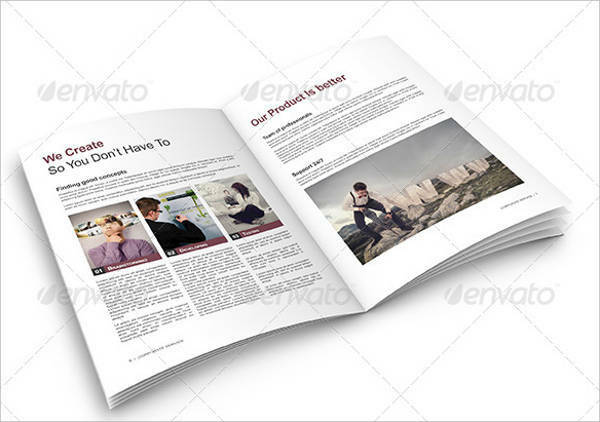 A graphic web brochure may require more visuals and images than text. Figure out the format that is required of your company, and be consistent with that. Keep text catchy and intriguing. Create headings that can encourage the reader to go on until the last sentence. Keep them short and concise as well. Don’t minimize the sizes of your fonts to fit a paragraph in your brochure. Your list of services should have a detailed but brief description. It’s important that your potential customers are well-informed about the services they plan to avail. This can greatly affect how they view your company, and whether or not they’ll want to contact you again. Provide contact information. 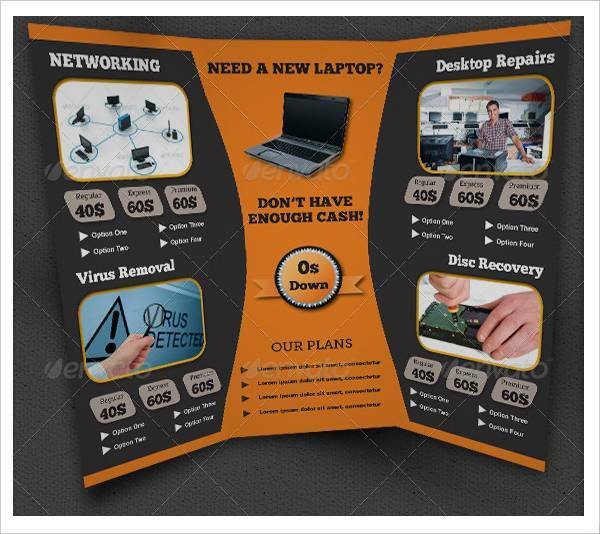 Your service brochure is a way to make customers reach you easily. When clients find out about your services, they want to be able to feel your accessibility. Provide your contact details and other methods of availing your service. Your response rate is one factor that can determine satisfied clients. Put up relevant images. The images on your service brochure should coincide with the message of your brochure. Let your potential customers see the effects of your services with engaging and vivid photos. Giving your customer a reassuring and accurate image of your work is one way to build trust. 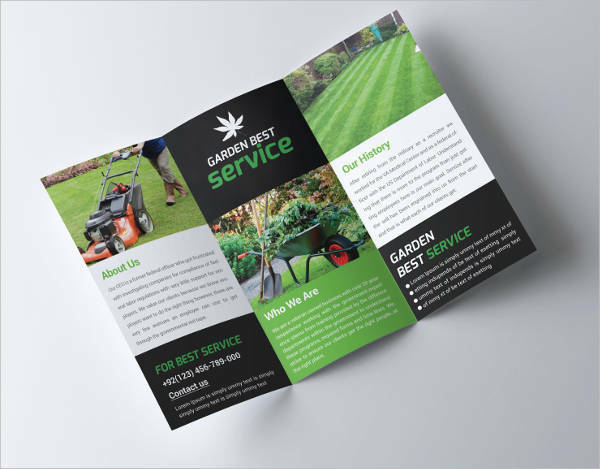 In designing your brochures, have a clear image of what it is you want to achieve—not just in terms of look, but with the overall message you want to send to your potential clients. 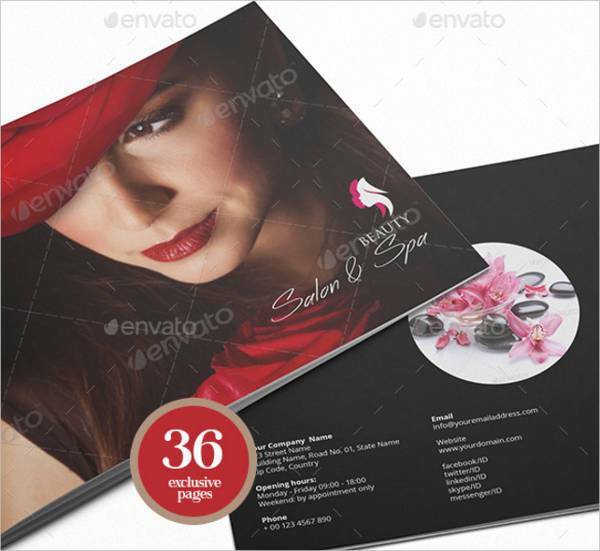 Knowing what you want to achieve will make it easier to pick out a business brochure design. 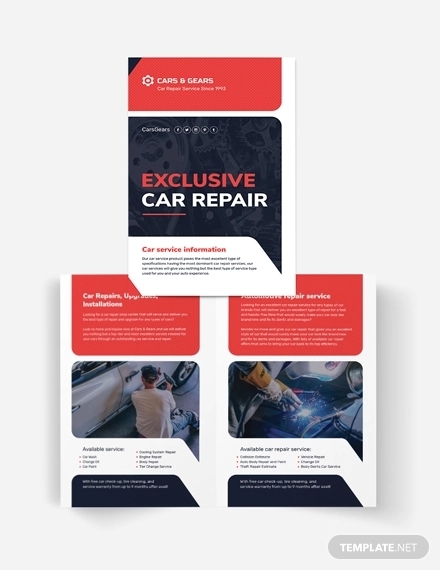 Our service brochure designs and templates are available for you to edit and download if you’re still looking for the right format. 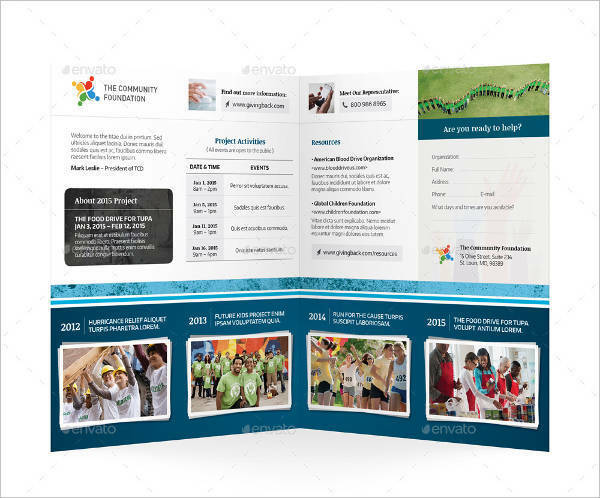 Don’t hesitate to get creative with them, and have your brochures looking their best.